It happens. We keep more items than we really need for a variety of reasons. They stack up in all the unused areas of our homes- the spare bedroom, the basement, the hall closet, the junk drawer, and on and on-until one day your home is over flowing with stuff. Thinking about de-cluttering can be overwhelming, but staying focused on the potential for all of the spaces you use as storage is a good motivator to get you started. With our 4 Week De-Clutter Challenge, you will be ready to live in all your home's spaces again by Spring! Before you begin, be prepared. You cannot tackle an entire house in one day. The de-clutter process is more about learning what you need to keep and what you can let go, so be prepared for some emotions along the way. Start when you have energy and time to get in a good rhythm. Each day you should spend 30 minutes on the items on our list. Have fun and keep your eye on the prize! Have garbage bags, storage boxes, packing tape and markers ready. Think about 3 categories as you move through the clutter- Keep, Toss, Give Away. This week focus on your bathroom spaces. Vanity cabinets, drawers and linen closets are typically full of items we don't really need. 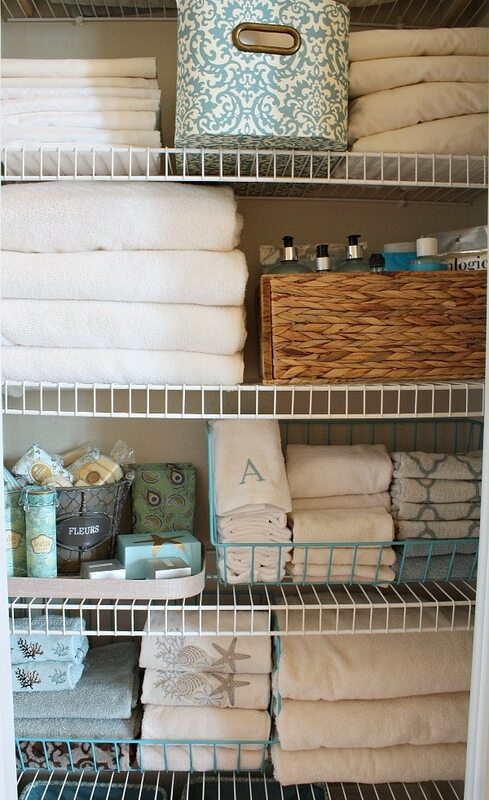 Get rid of old towels, washcloths and sheets. If these items haven't seen the light of day this year-get rid of them! Toss old hairbrushes and hair accessories. Go through toiletries and make-up and throw away the old stuff...dried up nail polish, old toothpaste, expired lotions, old air freshener, etc. Dispose of expired medicines and ointments. Now that you have cleared up space, assign each shelf, drawer and cabinet a specific purpose. Use matching baskets, bins or jars to store the items you do need everyday. When everything has a place, you will have an easier time keeping the clutter out. A good way to keep you on track is to imagine someone touring your house. This is especially important when you are selling your home. Buyers will look in every cabinet and closet, so make it pretty and get rid of things you don't need! The kitchen is the heart of the home and can also be a "catch all" for clutter if you don't stay on it. Go through your kitchen and make a plan for the clutter you see and the clutter that is hiding in your cabinets and pantry. Tackle the surface areas first. Recycle or shred papers and bills that you don't need. Remove items from the counter top that can find a home elsewhere- boxes of tea, cans of coffee, the mixer you use twice a year, etc. Clear off the magnets you don't use and keep only matching ones. Open the cupboards and drawers and evaluate what you have. It is time to get rid of dishes you don't use and utensils you have duplicates of. Do you have extra and unused coffee mugs? Tupperware with missing lids? Plastic cups you never touch? Items you only pull out on holidays? Ask yourself what you can live without and if there is a better storage space for holiday items. Throw out old spices, expired food, empty or near-empty cleaning products. Get rid of kitchen towels and washcloths that you don't use. There is a reason we call the junk drawer a junk drawer. You don't need to keep extra ketchup packets, chop sticks, random batteries, pens with no caps, paper clips, push pins and books of matches together;) Put things where they should go in the house and toss the rest. Now the fun part- treat yourself with a new organizational tool. Hooks for pans, a drawer organizer or a new mail station- whatever makes the most sense for your kitchen. 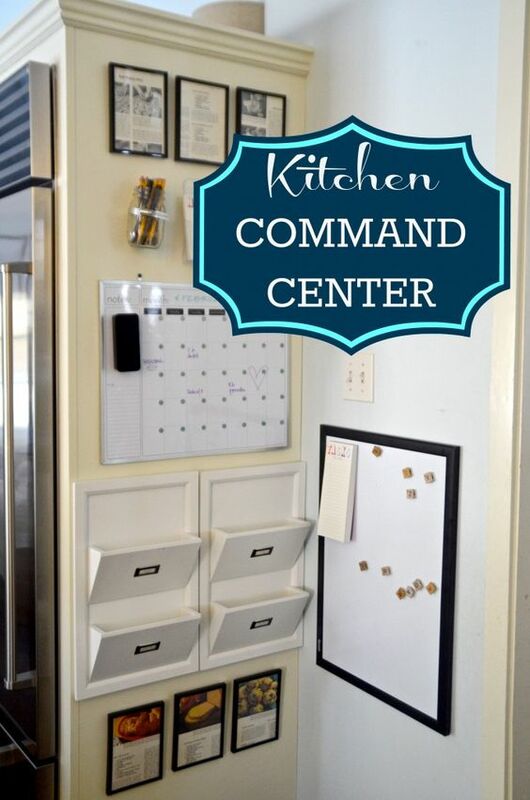 We love this kitchen command center idea from ciburbanity.com. Get everyone in your household on board. Cleaning up and organizing your bedroom gives you an oasis to relax in at the end of the day. Look around. Is there anything in your bedroom that doesn't make sense? A laptop? Piles of papers? An eliptical machine that is collecting clothes? The card table that you needed for wrapping presents before Christmas? Remove items that don't belong in your room and put them where they do belong, or get rid of them. Work through your closet with purpose. Get rid of clothes you haven't worn in 18 months. Get rid of clothes that you can't fit into. Toss broken hangars, empty shoe boxes, old dry cleaning bags, etc. Throw away socks without matches, the single glove, random shoe laces, shoes that have seen better days, t-shirts with holes in them, stained clothing and any other item you would be embarrassed to be seen wearing. Sort and get rid of purses or bags you haven't used in 24 months. Use the space on walls and under the bed for added storage options. Store seasonal clothes in plastic tubs under the bed or on a less used shelf in your closet. Create a jewelry, scarf or tie organizer out of a board and hooks, like this DIY option from gurl.com. Once you've completed this step in the master bedroom, move through the other rooms in your house and do the same steps. Children 10 years and older should be able to help with this process and you are teaching them that they are important decision makers. Learning organizational skills at a young age is important. It is also important for children to have clearly defined areas for sleep, studying and play and when they are part of the process, they are more likely to keep organized. If you have a spare bedroom that is all storage, plan to tackle this space with help. Have a friend over who will keep you on task or plan a family organizing day. Go in with a vision of your de-cluttered space to keep you motivated. Create three clear piles- Keep, Toss, Give Away- and sort items into these sections. If you are giving things away- put them in the car and drive them to the donation center at the end of the day. Do not wait. Only put items back in this room that make sense. Measure the successes along the way & feel good about turning your storage spaces into living spaces!